I am an author writing paranormal romance and urban fantasy romance. I can’t remember a time when I have not been writing something either creative or commercial. I started writing fiction when very young with six page stories that sometimes got me into trouble at school for being too long. I write in a room of a house, which has a very large window overlooking rural land with woods in the background. The view is great and the changing of the seasons is wonderfully evident. There is a particular stretch of the woods where a stand of smaller trees have the appearance of animals, a horse is obvious to me and was the inspiration for Cedric, in The Seven Spell Saga. It's an optical illusion of course but I like to see it emerge as the spring and summer cover the branches with foliage. 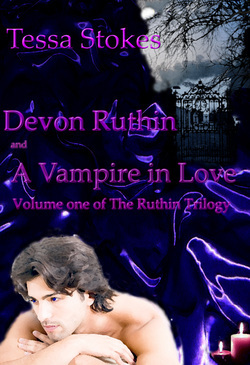 This paranormal romance/urban fantasy is the first volume in The Ruthin Trilogy. Bliss is lonely and taking chances when she goes off on holiday and meets the man of her dreams, Devon Ruthin. She is trying to replicate the life of a character in a book she has read recently, and without realizing it, she enters a twilight world. A world filled with strange people, beautiful powerful beings who seem to be the saviours of the man she falls in love with. This is a darker tale than first meets the eye, and as the story unfolds, it becomes obvious that the beautiful people, who are seemingly so wonderful, have secrets of their own. On her journey, Bliss encounters the pale and attractive Drew. It seems fate has a trick up its sleeve when we discover that he has met the mysterious people before. The chance meeting with Bliss sets off a series of actions by Drew that uncovers a hidden past belonging to Devon. This is a love story, a story of revenge, hope, violence, immortality, and fate. Who ends up losing their life or their love? Is Devon as free as he thinks? Follow the incorrigible, dangerous, and strangely lovable Drew in his quest to recapture a lost love. 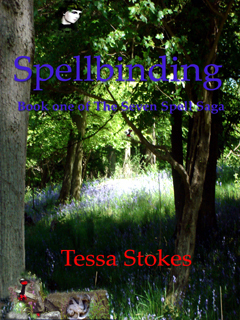 The book, Spellbinding is the first book in the series The Seven Spell Saga. It is paranormal romance, fantasy and suitable for readers sixteen and up. The series of books, The Seven Spell Saga follows the life of Chloe McGarry as she tells her story to you the reader. In the first three books it is only her voice that describes the adventures and romance she experiences but in the fourth book currently being written we hear from her best friends. In Spellbinding she establishes her friendships and relationships. As they fall in love, she uncovers the secrets held back from Tristan, one of the lovely male characters in the book. At the same time she falls in love, and becomes best firends with Oliver; a modern endearing character. Danger abounds, as the three main characters form an unusual trio, to help each other. This is a long book; you step into Chloe's life and hear about her feelings as she reports on what people say and do. When 18 yr old Chloe McGarry moves with her family from her home in California, to an English estate rich in history, she isn't sure what to expect. She never dreamed she'd get caught up in a mystery that has lasted for more than eight hundred years, nor that she'd fall in love with two gorgeous guys. Chloe's never been lucky in love that is until she meets Oliver Tarrant. He's charming, interested in her and amazing looking. Is he all that he seems? Her new home holds many mysteries. Out one day exploring the grounds she stumbles across Tristan Dearing. Tristan is enigmatic and beautiful; to begin with, he tries to keep himself apart from Chloe, until she uncovers his secret; a secret he has been keeping for 800 years. The book is paranormal romance, fantasy and suitable for ages sixteen and up. In the second book of the Seven Spell Saga, Oliver is still missing from Tristan and Chloe's life. His friends are puzzled and concerned by his sudden disappearance. Tristan instigates a search for him in despair over Chloe's grief at Oliver's disappearance. Will Chloe and Tristan ever find Oliver? I became interested in writing contemporary fantasy when looking back on some strange experiences. The first three finished books of The Seven Spell saga were a joy to write and I hope you fall in love with the characters as I have. When I was writing The Spell Breaker, book two in The Seven Spell Saga, I wanted to start adding some of the mild humour that would be sprinkled throughout the next book, book three The Seven Spell. The note that Tristan leaves for Chloe to find in his room has two functions. It is part of the story in The Spell Breaker, and a bit of fun. Oliver and Chloe don't understand the note, they comment upon it and in the end, it does not help them break the spell that Tristan is under. That's part of the joke, since Tristan has left a message within that cryptic little note, which would tell them how to free him, if they could decipher it. Readers may decode the message, it doesn't matter if they don't, that's the fun part. I had the ideas, and much of the plots for all the books in The Seven Spell Saga for a couple of years in notes on my computers and in my head. I knew the middle book, book three, The Seven Spell, would have some humour within it to counteract the unpleasant experiences, that befall Tristan and Chloe. I wanted the ending of The Spell Breaker to herald the arrival of that humour. Tristan Chloe and Oliver think they are finally safe from the influence of the 800-year-old magic spell that had hung over Tristan's life. 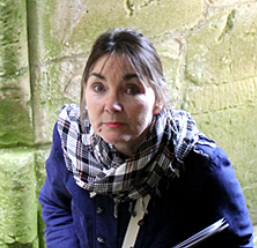 The arrival of a man behaving strangely at the Abbey Museum heralds a new twist in their story. As everyday life goes on, with Jack Dearing seemingly determined to rid the family of Tristan, and Chloe heading deeper in love with Oliver, a series of bizarre magical things happen to complicate everyone's life. Does the beautiful girl visitor that catches Tristan's eye mean the end of Chloe and Tristan? As events spiral almost out of control, Tristan fights to save his home and his relationship with Chloe. 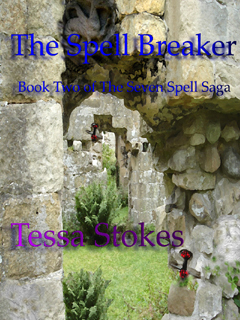 The Seven Spell is the third book in the series The Seven Spell Saga. It has more romantic moments between the main characters, there is also humour sprinkled within the story to act as a foil against some of the more unpleasant experiences the characters face. The love triangle persists, and becomes more complex. More information about Tristan's past is uncovered and present family intrigues make life difficult for Tristan. The title of the book is a reflection of the title for the whole series, The Seven Spell Saga. 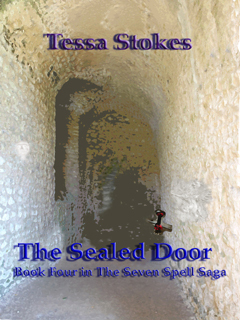 A paranormal romance, The Sealed Door is suitable for eighteen years and up; in this, the fourth book, The Seven Spell Saga, grows up. In The Sealed Door, we find Chloe McGarry still in love with both Oliver Tarrant and Tristan Dearing. Both Oliver and Tristan love her too. The Sealed Door sees the relationship between Oliver and Chloe become very serious and yet she is still unable to choose between him and Tristan. Oliver suddenly realizes she will never choose between them, will it change his feelings for her? As everyday life goes on between magical happenings, we hear from Oliver and Tristan. Oliver describes his experiences and we find out more about how he feels. The Sealed Door has some interesting revelations about Tristan’s past. He finds himself feeling emotions he never expected to feel. He surprises his friends by his actions; this is not the Tristan we have come to know. When Tristan asks the archaeology team to open the sealed door found in a tunnel below his house, where Chloe lives, a surprise awaits him. Trouble is on the horizon from a surprising source. Tristan, Chloe and Oliver think they have encountered enough magic to have grown used to it by now, but they find this latest brush with witchcraft almost too much to bear. Who is Lily and better still who is Anna? When yet another experience from the past catches up with Tristan, the only thing that will fix things is yet another time travel adventure. The Sealed Door is sprinkled with love, magic, romance, danger and the unexpected. This Limited special edition of the first two books of The Seven Spell Saga, combines both Spellbinding and The Spell Breaker, the companion book in one book. Limited to the summer of 2011 this book is a special introduction to the continuing series. Suitable for eighteen years and up the book's dynamics of romance, time travel, adventure, magic and paranormal romance make for some interesting plot twists and turns. 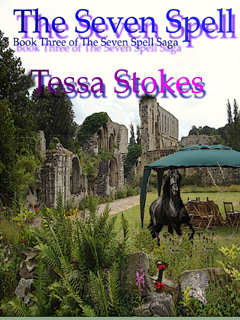 Written from the viewpoint of the main female character in the first three books of The Seven Spell Saga, it provides a picture of her life and thoughts as she moves to a different country Chloe McGarry moves from her home in California, to a village and estate in England steeped in history and mystery. She has never been lucky in love, and to her surprise she meets not one, but two lovely guys. They are both interested in her and become her dearest friends. She falls in love with both of them and they both fall in love with her. One of them, Tristan is especially enigmatic. He has been keeping a secret for eight hundred years and as Chloe forms a relationship with him she helps him unravel his heritage. There are dangers around every corner as her other love, Oliver is mistaken for Tristan by an ancient family of Magi bent on collecting a debt owed by Sir Edmund Dearing. The three, brought together by danger and adventure as well as love, become friends. Life goes on around the estate but the magic that has followed Tristan all of his life continues to threaten his very existence. Chloe must travel in time to save him as she realizes how much she loves him. Oliver helps her in the quest to free Tristan from the magic spell, only to lose himself. The romantic adventure has many twists and turns. Ordinary life is peppered with magic and love.